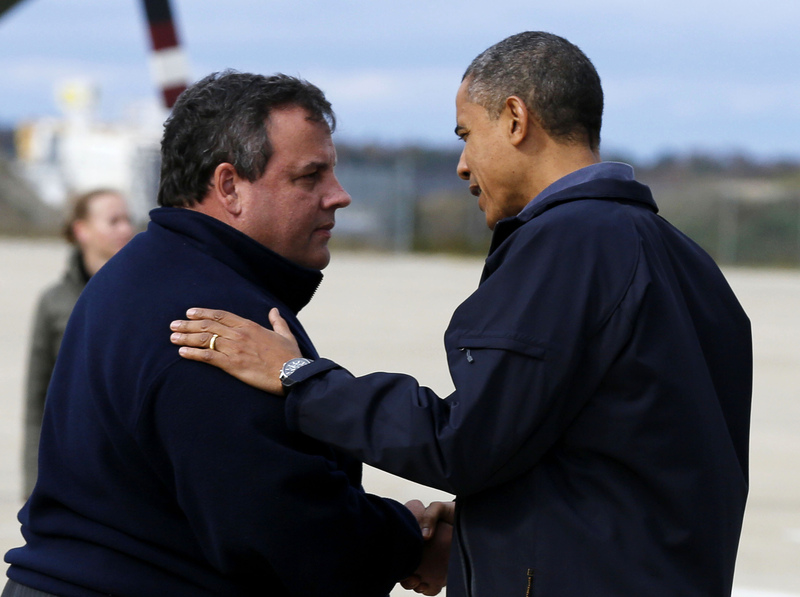 Chris Christie’s budding bromance with Barack Obama may grow even stronger. New Jersey’s Republican governor, who praised the president as they surveyed superstorm devastation together last week, faces a Sandy-related revenue hit that will make it hard to balance the budget, as mandated by the state constitution. That could leave Christie stealing a page from Obama’s election playbook. Recent history may provide a guide for the Garden State. Hurricanes Katrina and Rita contributed to a 42 percent decline in Louisiana’s tax receipts in third-quarter 2005. Considering, for example, the direct impact on Atlantic City, a gambling and convention hub, New Jersey could easily experience something similar. That would equate to some $3 billion of lost revenue, assuming the state generates an equal amount each quarter. Federal funds, insurance payouts and rebuilding efforts would help mitigate such losses. Louisiana’s tax receipts rebounded by a third in the following quarter. The delay could be tricky, however, especially when clean-up costs hit the $32 billion budget much faster. New Jersey already has an income problem. Despite its small budget surplus, revenue is running 16 percent below pre-crisis levels, according to the Pew Center on the States. Even before the hurricane, inflows were falling short of Christie’s optimistic projections for the fiscal year ending in June. That means the governor could need to make some unpleasant choices in 2013, an election year. Christie has already slashed from previous years’ budgets, including unpopular choices like after-school programs and services for low-income residents. If the lost revenue can’t be recaptured, not only will Christie have to explain his failure to cut taxes further, but he’ll need to convince voters to accept stingier services or pay more in a state that already has the second-highest burden in the country. That gives the governor a chance to show how to orchestrate the sort of compromise he has found lacking under Obama. And yet Christie also may need to take some cues from his new bestie. Throughout the president’s re-election campaign, he leaned on the argument that he was dealt a terrible hand. Christie, who also may have aspirations to higher office, will know soon enough if the strategy works. U.S. President Barack Obama (R) is greeted by New Jersey Governor Chris Christie after he arrives at Atlantic City International Airport in New Jersey before surveying Hurricane Sandy damage, October 31, 2012. Superstorm Sandy is expected to have caused between $30 billion and $50 billion of economic damage in the northeastern United States, according to forecaster Eqecat. New Jersey’s budget estimates revenue for the fiscal year ending in June 2013 of $32 billion, up from $30 billion the previous year. The state’s revenue is about 16 percent lower that its pre-recession level, according to the Pew Center on the States. New Jersey’s constitution requires the government to balance the budget. Louisiana tax collections fell to $1.5 billion in third quarter 2005 from $2.6 billion in the previous three-month period after hurricanes Rita and Katrina struck the region, according to a 2006 U.S. Department of Commerce report. Revenue rebounded to $2 billion in the fourth quarter and $2.2 billion in the first quarter of 2006. Governor Chris Christie is up for reelection in 2013.